I have been blogging for over half my life. I began blogging before blogging was even popular. I have always enjoyed working through my thoughts by writing. I write in two blogs; this one which is public and a more private, more anonymous blog elsewhere. Looking back at my entries in my private blog recently, I discovered that I tend to use my blog to complain. There are few entries filled with gratitude and thankfulness which saddens me. I have much in my life to be grateful for and I need to show it better. Therefore, I'm turning Thursdays into "Thankful Thursdays". On Thursdays, I will write ten things I am thankful for and why I am thankful for them. Feel free to participate! If you do, be sure to comment on this entry with a link to yours so I can check it out! My baby boy. I always wanted to be a mother. When I was in high school, I decided I would be married and done having my children by the time I turned 25. This is laughable as I didn't figure out who I was or meet the love of my life until I was over 30. I am thankful I was able to have a normal pregnancy and childbirth experience at 33 years old. I'm thankful my son is healthy, smart, funny, and growing wonderfully. My husband. My husband is my soulmate. I honestly don't know if I believed soulmates existed before I met him. He is my perfect complement and makes me strive to be a better person. He is hardworking and supports our family so I can stay home with our son. He is loving and endeavors to make me as happy as possible. He is funny and can make me laugh on some of the roughest days. My family. This time of year where I realize how amazing my family is... this includes both immediate and extended family. Many members of our family go above and beyond to help us out when we need it. We are forever grateful for any help we receive no matter how small. 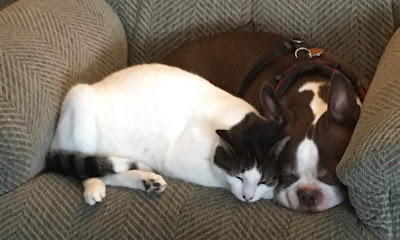 My pets. I love my pets. My cat tends to annoy the heck out of me, but he's adorable so I guess that counts for something. He's only two and has so much energy to burn! I've had my dog since he was about two months old and he's now nine years and three months old. He's turning more and more gray which makes me sad. When we got the cat, he and the dog didn't really get along, but look at them now!!! My home. When my husband and I married, we lived in a little house in a run-down town. We were about half an hour from his parents, but about an hour and fifteen minutes from my parents. The town had nothing in terms of stores or restaurants. Before we were married, we decided we wanted to live in a certain town. This town has many great stores and restaurants, an amazing school district, and is right in the middle of both sets of parents. We sold our first house eight days after listing it and quickly searched for a home in our dream town. We stumbled upon one and made an offer. We've now lived here almost two years and we've put a lot of work into it. I love our home, though. I'm excited to raise our child(ren) here. Christmas. Christmas is my favorite holiday and always has been. 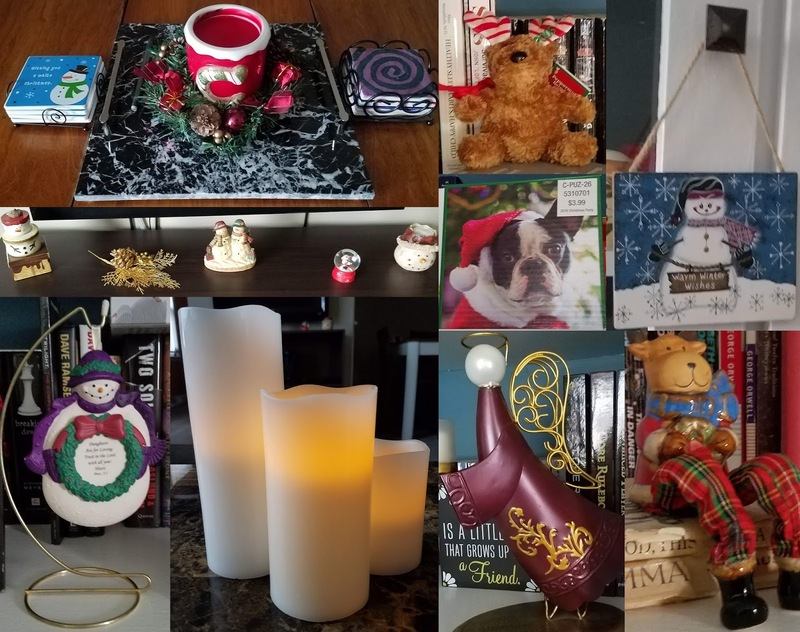 My maternal grandmother absolutely loved Christmas and her love rubbed off onto many of her children and grandchildren. I love Christmas because of all the quality time spent with family. I love giving gifts and seeing the reactions of people as they open what I have purchased for them. I love the decorations and the snow. I love the carols. It's hard for me to believe Christmas is in five days, but I'm excited for our first Christmas with our son. Winter. While Fall is my favorite season and is followed by Spring, I am happy it is Winter. Here in east central Illinois, we really don't get a Fall or a Spring, but we do get a Summer and a Winter. I despise being hot. It makes me super cranky. Therefore, I enjoy Winter much more. The beginning of December had lots of snow and really cold temperatures, but for the last week or so, temperatures have been more mild (in the forties) with no snow. While I'd love a white Christmas, the chances of that happening are slim to none right now, but hey... at least I'm not hot! My UBAM business. I became an independent consultant for Usborne Books & More back in February. My first few parties went amazingly and created an excitement in me to spread literacy to as many children as possible. However, my pool of hostesses and contacts quickly became a puddle and I struggled to find people to host parties and buy books. I took a little bit of a hiatus from my UBAM business, but have found a new excitement it! My vendor friends. The new excitement for my UBAM business comes from the help of two friends. I have been looking into vendor booths locally and also am in my first online multi-vendor party on Facebook which starts tonight. I am super excited about these opportunities and hope it helps me gain some new host prospects. I love throwing parties! Books. I have read a ton this year. I have read thousands of books in my life! I love books and reading. I am thankful my parents instilled a love of reading into me and that Kindle Unlimited exists. The past week has been hectic with holiday preparations. On Wednesday, I located and busted out all of my wrapping supplies – wrapping paper, boxes, bags, tissue paper, bows, gift tags, etc. I also rummaged around the house and located all the gifts we bought for family members this year. I set up a wrapping station on our dining room table in hopes of being able to begin the process of wrapping presents. I believe two presents were wrapped before my five-month-old son demanded my undivided attention and wrapping was put on the back burner. On Thursday, the orders from our wine party were delivered. We were taking three of the five orders to my parents' house, one was being picked up by our wine guide, and the final order belonged to my cousin who happens to live in the same town we do. I sent her a text to let her know her wine was in and said it would be a good day to visit the baby if she wanted to come by after work. She got to our house around three o'clock in the afternoon and stayed for a couple of hours. 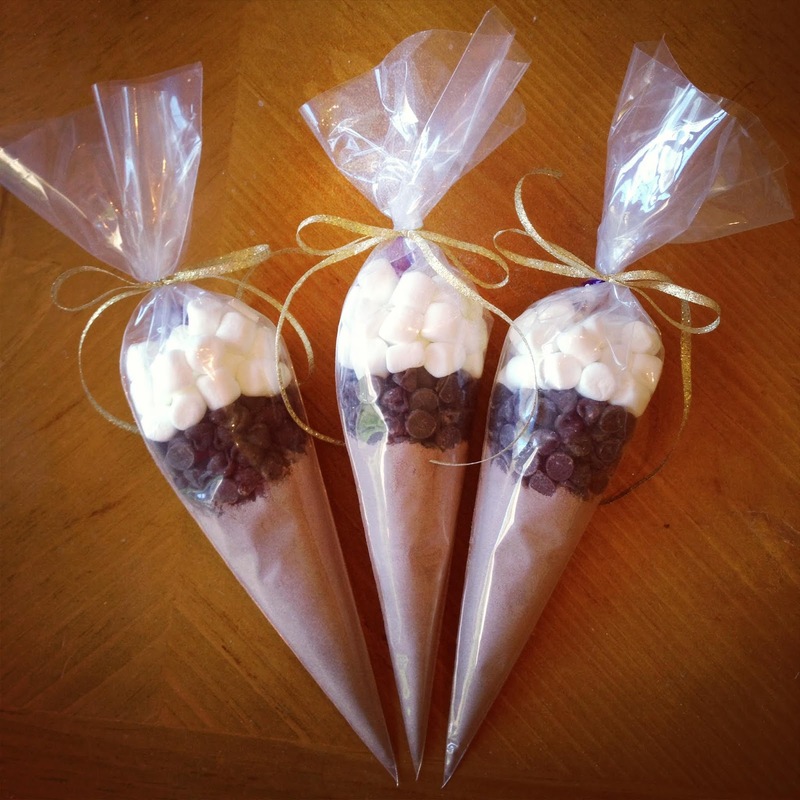 While she was over, I got to work on making Hot Cocoa Cones to give out as small gifts to some people. We bought all of our supplies on Amazon and were planning to make 50 of them. The supplies made slightly less – around 42, if I remember correctly. The price each had we been able to do 50 of them as around $0.50 each which is awesome! Regardless, we made plenty cones to give to the people we had decided to gift them. Next, I got out all my supplies to make the cones. This included Swiss Miss hot cocoa mix, Nestle milk chocolate chips, mini marshmallows, and twelve inch piping bags. 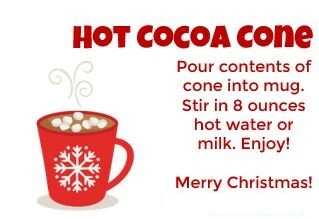 After looking at the serving size of the hot cocoa mix, I decided to use one quarter of a cup in each piping bag (the suggested amount to mix with eight ounces of liquid) topped with two tablespoons of chocolate chips and one third cup of mini marshmallows. I twisted the remainder piping bag and knotted it, took some red and white braided twine, cut a piece, strung it through the tag, and tied it on under the knot. After finishing the cones, I wrapped a few more presents which had to be wrapped by Saturday as we had our first Christmas party of the season. It was at my parents' house and completely atypical of our normal Christmas celebrations. A normal party at my parents' house runs from 10:00 AM to 3:00 PM on Christmas Day. My husband and I would usually stay all night there Christmas Eve. We would have stockings from Santa, breakfast of biscuits and gravy, open presents, and then have a big lunch including steak or prime rib and numerous delicious sides. This year, my parents are taking a cruise over Christmas and will be gone so we celebrated early. We got my niece a present and small gifts for my parents. For my siblings, we had a white elephant gift exchange with new gifts and a $10 limit. We bought this awesome large coffee mug with a donut warmer on top and a decorative pillow. I ended up getting a gold Christmas-themed wax warmer. It's really pretty and I like it! My husband got a mini shop-vac that connects to the AC adapter in the car. We ate the equivalent of Thanksgiving dinner – turkey, mashed potatoes, noodles, dressing, corn, cranberry sauce, and rolls. We also celebrated the birthdays of my niece, cousin, and brother's girlfriend. My husband and I created a four-layer cake with each layer a darker shade of pink. I made homemade buttercream frosting for the first time. The cake was amazing in taste and appearance. I really wish I had taken a picture! Anyway, as of now, we may have a party to attend on Saturday and my husband's side of the family is celebrating on December 26th. After Friday, my husband is off work until January 2nd. I'm so excited to have him home with our son and me for so long! Should be a pretty relaxing Christmas break. ... to have hosted a wine party at our house on Sunday. I'm not a huge wine drinker, but it was still a lot of fun and we got a great deal on some awesome wines and accessories for hosting. Have you heard of Traveling Vineyard? ... to kind of miss being pregnant when I see posts on social media from friends or family who are expecting. A friend's daughter-in-law posted a video of her baby moving in her belly and watching it made me miss that. My baby is about five months old so we're not planning to add to the family quite yet, but I look forward to feeling a child move in my belly again. ... to be proud of myself for writing so much so far this month! As the baby is getting older, I have a little bit more time to do things because he can entertain himself somewhat. I'm glad because I really miss it when I don't write! ... to feel a bit anxious when I think of our schedule for the rest of the month. We have so much going on, but I will enjoy seeing family regardless of my anxiety over it all. ... to not enjoy every book I read. I'm a part of a program called First to Read where I can read new releases for free before they hit the shelves. My title this month has drawn me in and out of it the whole time. Right now I'm out of it so I'm not wanting to read it. I need to finish and review it soon. Have you heard of Traveling Vineyard? It's a direct selling company, but instead of selling sprinkles or make up or books "wine guides" sell wine. A former coworker became a wine guide earlier this year. My mother hosted a wine party back in June, but it was the day of our baby shower and I was exhausted after so we didn't go. A family friend hosted a wine party back in October, but we were unable to attend that one too. I decided we would host a party ourselves. We set a date. About two weeks prior, our wine guide brought us an information folder. It included all the information about hosting a party along with foods that pair well with the wine. As a part of hosting the party, you are in charge of providing snacks that pair with the wines to your guests. Zapatazo Torrontés: Brilliant pale lemon-yellow in the glass. Nose of white flowers and stone fruits, peach fuzz & ripe apricot. This wine tastes as it smells, plus a hint of minerality. Good acidity and feel, light bodied and crisp, with a lingering freshness. Hoot White Blend: Brilliant pale straw, medium body. Slightly vinous white flowers nose over nuts and approaching spicy stone fruits, nectarine-to-apricot. Good fresh acidity and acid/sugar balance, richer-than-expected mouthfeel, good extraction. Rayado Cabernet Sauvignon: Herbaceous black earth fruit nose over toasted plank, baker's chocolate & black earth; with smoke & black pepper touches. Integrated, balanced & concentrated black fruit over the nose flavors, lengthy finish. Juicy, fruity, smooth & quaffable as a burgers-on-the-grill red, or with beef stew and Italian red sauce dishes. Never Have I Ever Pinot Noir: Translucent garnet-to-brick hues in the glass. Aromas of dried strawberry and raspberry. A whiff of warm spice and dried herbs/violets. Soft on tannins, light-to-medium bodied, clean, balanced and accessible. Fissata Blonde Fizzy White Wine: Gently sparkling with notes of peach, white flowers, mandarin orange and nectarine. The palate also shows hints of ripe melon and dried apricot. Our wine guide also brought a Caramel Apple Sangria made with the Zapatazo wine, caramel vodka, and apples. I'm sure there was more to it than that, but I don't have a copy of the recipe. We started the night with the sangria. It had a very strong caramel flavor. It also tasted strongly of alcohol to me. While I could have drank the entire glass of about 4 ounces, I only drink about half of it. I did like the flavor, but after not drinking much for over a year due to pregnancy and breastfeeding, I didn't want to risk ingesting too much alcohol right off the start. We then began the actual tasting. This included looking at the color of each wine, swirling, smelling, and tasting. We tried the wines in the same order listed above. The first wine we tried was the Zapatazo. This wine was also used to make the sangria. It was a little drier than I normally like when it comes to wine, but I drank my two ounces. We paired this wine with cream cheese topped with spicy red pepper jelly and club crackers. While I didn't feel the pairing actually improved the wine, the crackers were delicious! We moved onto Hoot after that. This is a wine our guide thought I would really like. After the first sip, I wasn't sure how much I liked it. Our guide mentioned something about needing to eat something salty to get the sweetness of the pepper jelly out of her mouth to fully enjoy the wine. We paired this wine with buffalo chicken dip and corn chips. After eating a corn chip with dip on it, the wine tasted much better. I thoroughly enjoyed this wine. The next two wines were red wines. I am allergic to red wines and have a pretty severe gastrointestinal reaction when I drink them. I didn't try either of these wines because of that, but I did eat the pairings. We paired the Rayado with fudge brownies. My husband wasn't a big fan of this wine, but after our wine guide poured it through a decanter, he enjoyed it much more. I guess the decanter made it more light and airy. The Never Had I Ever was paired with cheddar cheese and crackers. My husband and my mother loved this wine. The final wine we tried was Fissata. This wine was paired with barbecue chips and orange juice. The chips were the main pairing as the orange juice was used to make mimosas. I really enjoyed this wine. It made super yummy mimosas too. Our wine party was a lot smaller than expected because six of our twelve expected guests cancelled last minute. They all had good reasons for being unable to make it, but I was a little disappointed. Once our party was underway, though, I enjoyed the small group. We had more wine and snacks to share among the eight total people who were here. All of the food except for three small brownies and about a cup of the buffalo chicken dip was eaten. There was barely any wine left either. Everyone who attended our party ordered along with two people who weren't able to make it. We ended up getting a pretty good deal ourselves. We ordered a couple bottles of the Never Have I Ever as my husband really enjoyed this wine. Because of this order, we got a free bottle of wine and I wanted to get a bottle of Hoot. We also got two half priced accessories. We ordered the Magic Decanter Aerator which I'm gifting to my husband for his birthday (from back in May!) and the Wine Saver. Because we ordered three bottles of wine, we also got a great deal on some tulip wine pourers. While I am not a huge wine drinker, I thoroughly enjoyed this party. I would attend one if hosted by someone else and may host another myself sometime next year in hopes more people would be able to attend. I learned a lot about wine tastings and pairings. I also got to try some wines I wouldn't have had the option to otherwise. The wines sold by Traveling Vineyards is not available anywhere else. The guests we had also enjoyed the party which is always great to hear! If you have an opportunity to go to or host your own wine party with Traveling Vineyards, I would highly recommend it! Growing up, I don't really remember having real Christmas trees. I know we did on a few occasions, but I only remember helping my dad put together the artificial tree each year. The first year my husband and I were together, we were engaged at Christmas. I was living with my parents an hour and twenty minutes southeast of where my (then) fiancé lived. Because we had a tree at my parents' house and he had a tree at his parents' house, we did not decorate at his house. This also meant he did not have a tree there. The following year, we were newly married when it came time to decorate. We went with my new in-laws to get our first real tree. There is a store near where we live called Prairie Gardens. This is a home decor store and is mainly full of holiday decorations this time of year. There are several locations within Illinois and their decorations are amazing. When we went shopping for a tree that year, Prairie Gardens did not have a great selection. There were a few nice trees, but nothing any of us wanted to buy at that moment as they were more expensive than we had planned. We left Prairie Gardens and went to Menards to look at their trees. We ended up buying a Fraser fir at Menards as they were cheaper and looked better than the trees at Prairie Gardens. We later learned this was a big mistake because the tree was super dead, didn't drink any water, dried out, dropped all of its needles, and basically became a big fire hazard. Because of the troubles with the prior year, last year we looked into a tree farm. There are several well-known trees near us, but these trees become overrun and its hard to find a good tree unless you go early in the season. After some research, we found one pretty close to us which wasn't as well known. We went there and it was awesome! The weather was cold, windy, and terrible, but we enjoyed our experience anyway. We were with my in-laws again and both families found trees we wanted quickly. The farm shook the needles out and netted the trees for us while we paid. Our tree was gorgeous. It was some kind of a pine tree, smelled citrusy (almost like oranges), and was vibrant and alive the entire Christmas season. It hardly dropped any needles and I loved it! It's so pretty and I love it! I love getting the occasional whiff of real Christmas tree. It smells awesome. I hope having a real tree each year can become a family tradition for us. Hopefully, the tree farm we used last Christmas opens back up because, again, that farm was amazing. It would be a great place to take our kids (our current one plus any others) in the coming years! What are your holiday traditions? Do you get a real tree or have an artificial one? ... for life to have, once again, gotten in the way of blogging. Now that my son is getting older, I will have a greater chance of being able to blog regularly. We shall see, I suppose! ... to be done with Christmas shopping already. We're waiting on several gifts to come in the mail yet, but I'm pretty sure we're done! We may have one small gift/thing to do for a group of friends we game with, but other than that, we're done! ... for my husband and I to decide our gifts for each other will be a "mommy day" and a "daddy day". This will be one day while my husband is on winter break (December 22nd through January 2nd) where we can each do whatever we want while the other will take sole care of our son. It will be nice to have a day to do whatever. It will stink a little bit on my part as I will still have to break from my "mommy day" to pump. ... to have decided to take up crocheting. I really love doing crafty things. I know how to piece quilts, but that makes such a big mess. I wanted something with less of a mess so I did a little research. My aunt, a family friend, and one of my good friends all crotchet. It seems like something I would really like to do. I put a beginner's kit of yarn skeins (basically just a bunch of colors) and a set of aluminum hooks on my Amazon wish list for Christmas. The entire thing would be about $20. If no one buys them for me, I may buy them for myself. I watched a couple of beginner's videos on YouTube and it looks easy. ... to feel a little anxious about all of the stuff we have planned between now and the end of the year. We don't have a weekend free until after Christmas. It will be good to see family though! I do enjoy seeing people. ... to have thoroughly enjoyed hosting our gaming group at our house this past Sunday. Our normal hosts were unable to welcome us into their home because of illness. We didn't want to miss a chance to game (we play Pathfinder) since we usually miss several sessions due to the holidays coming up and possible bad weather so we offered to host. It was a fun session and we were able to play a little longer than usual since we were able to put the baby in bed when he got tired and we didn't have a 45 minute drive home. As a way to start each month, I want to keep track of what's currently going on in my life by discussing several different topics. I hope to post an entry like this the first day of each month. Hopefully I can keep up with a post as easy as this each month. Haha! I am currently trying to read Outlander by Diana Gabaldon as I've been watching the television series. However, the beginning is kind of dull with all the history of Frank's ancestors. I understand those who haven't watched the series would need that information in order to know what's happening, but to me it's boring. I'll keep at it whenever I have a chance. Right at this moment, we are listening to Christmas Radio on Pandora. It's the first of December and we just bought our Christmas tree. We will be decorating it soon and the music is to help us get into the Christmas spirit. Otherwise, I haven't really been listening to much music. When I do, my favorite is listening to a station on Pandora my husband has been working on perfecting for years. We have similar tastes in music and the station is quite enjoyable! I've been watching more TV lately. I have really been enjoying New Amsterdam and A Million Little Things as new shows this fall. As usual, I love This is Us and Grey's Anatomy too. The husband and I have been "binge watching" The Librarians lately. By "binge watching", I mean we're watching however many episodes we can while we're together and not super busy. Oh, man. I can't even remember the last time I watched a movie. I don't watch many. My husband and I keep wanting to set up a date to go see Fantastic Beasts: The Crimes of Grindelwald. Not sure if that will actually happen or not. I'm supposed to go with my mom to the movies next weekend... to chaperone three girls between the ages of 7-9 for my niece's birthday. I'm not even sure what we will be watching. It's now December so I'm sure I'll start watching Christmas films on TV, too. With the upcoming holidays and Christmas shopping, I would have to say I visit Amazon more than most other sites right now. We have a Prime membership and do the majority of our shopping on Amazon so yeah... I visit the site at least once daily right now looking for gift ideas. Is it wrong to say my own? I've been redesigning and working on my blog lately. I felt like I needed something new in order to stick with the blogging. Hopefully it helps, but we'll see. I mean, I always have high hopes of getting into blogging more, however, my four-month-old mini-boss doesn't always agree with me sitting at the computer and writing. I love the Post Secret app right now. I get up around 1:30 in the morning daily to pump breast milk for my son. On Sundays, I always check Post Secret at that time... just after they've been posted for the week. I really wish secrets were posted more often! My mom's side of the family has a big Christmas party the Saturday before Christmas each year. As we're on more of a strict budget this year, we're making our stocking stuffer gifts for everyone over age 5. We've been slowly working on buying all the necessities for putting these gifts together. That is my current project. In regards to our house, we're still working on remodeling the half bath and putting finishing touches on the kitchen. We tore everything out in the kitchen and half bath almost eight months ago. I feel like we'll never be done working on our house! I suppose my relationship with my husband. We're happily married, but we have our disagreements like any other couple. Luckily, we discussed how to handle arguments when we first started dating and agreed to not let bad feelings fester. I was feeling annoyed on Wednesday morning and let him know. We talked about ways to fix the issue causing me stress and now we're great. I love having a mature relationship that is always growing. We went to get our Christmas tree today and it's rainy. I'm wearing skinny jeans, a black nursing tank with a sheer pink sweater (with a multicolored sheath which sticks out the bottom) over it, and some winter boots to help protect my footsies from cold and rain. This outfit is way better than my normal daily SAHM outfit of pajama pants, a nursing tank, and house slippers. Haha! Leaving the house always makes me want to dress up since I'm stranded here with a four-month-old all the time. I feel pretty good about myself lately. Granted, I am almost always without makeup and with natural hair wearing pajamas, but I still feel pretty good about myself. Basically any time I leave the house, I "dress up" meaning I curl my hair and wear makeup. I only leave the house about once a week, though, because we currently only have one working vehicle which my husband takes to work with him. Baby smiles. I love making my baby grin. He has the most adorable gummy grin. Also, the Snickerdoodle Cookie Dough Blizzards from Dairy Queen are amazing! When I was a child, I would eat vanilla ice cream with cinnamon sprinkled in. The Blizzard tastes like a fancier version of that. So... so... SO good! I'm not currently eating anything, but my newest kick is toast with peanut butter and sliced bananas. This has been the "morning snack" my husband and I have been eating before breakfast for a couple of weeks now. It's so filling and delicious. The last thing I ate was some Dulce De Leche Owls (Girl Scouts chocolates). They remind me of those Carmello candy bars. So good! Current drink.Chamomile tea. Once the weather turns cold, I love hot tea. I can't drink it during the warmer months. I have been drinking tea each morning and chamomile with honey is my favorite. I also have an Apple Cinnamon Spice tea and a black tea with currants in it. Occasionally, I'll have some hot cocoa. Current feelings.I'm excited it's December. I love the Christmas holiday and all that comes with it. We picked out our tree today and will more than likely decorate it later as well. We have been looking into gifts for people which is always fun. Also, the baby is beginning to interact more with people as he's getting older and I can't wait to see what comes next for him. Current wants.More money? My husband just got a promotion at work which came with a bit of a raise, but we literally split our income in half when I became a SAHM. Losing half your income is hard and we're having some minor issues with sticking to our new budget. It will take some getting used to, but I know we can figure it out. Still... more money would be great around the holidays. A nap would be heavenly. The baby was very cranky and overstimulated last night. He didn't go down until 9:30 which means the husband and I didn't get to bed until around 10:00 PM. We were both up at 1:30 AM so I could pump milk. We were back in bed by 2:30 or so, but I struggled to fall asleep again. The baby woke us up for the day at 6:20. The baby is currently napping and I'm taking the break to write this post. Hmmm. I don't know that I'm currently annoyed about much. I'm home and wearing real clothes which is unusual. My skinny jeans are a little snug around the middle because of the way I'm sitting. I guess that is annoying. *shrugs* Life is pretty decent right now. Our Christmas tree. We have had a heck of a time finding good live trees each year of our marriage. This is our third Christmas together as a married couple. The first year, we couldn't find a good local tree farm so we went to a holiday store in a town near us. They didn't have any decent trees for a good price as the ones that looked good were too expensive. We ended up buying our tree at Menards and it was a terrible tree. It was old and wouldn't drink water so it became super dry and dropped all of its needles all over our house. Last year, we found a nice little Christmas tree farm nearby and found the cutest, nicest, great-smelling tree. We planned to go there again this year, but my husband called this morning to make sure we could go through their fields because of the rain we got and heard a recorded message saying they weren't open for the Christmas season this year. We ended up going back to the holiday store we went to two years ago because my father-in-law heard the store had shipped in over a thousand trees from Canada. We found a gorgeous Balsam fir for a really great price. It's currently standing in our living room waiting to be decorated. I love decorating the tree!! !